Kaiser Chiefs' new album is taking them "longer" to work out how to play live than their previous records. The indie rock group are gearing up to release their sixth studio LP 'Stay Together' and debuted some of the new tracks at a special show at London's Palladium on Monday night (11.07.16). After their performance bassist Simon Rix, 38, admitted he doesn't want them to sound like "dinosaurs with guitars" and that it was important to embrace "modern technology" despite it being harder to work out. He explained: "It's taking longer to work out how to perform each song live than with a normal Kaiser Chiefs album, where it's about guitar, bass, drums and keys. We're trying to work out who played what in the studio with Brian. But you want modern technology. You don't want to just be dinosaurs with guitars." The 'Oh My God' hitmakers' frontman Ricky Wilson has also defended their decision to use co-writers in Wayne Hector and MNEK for the record and admitted there would have been no chance of them going down this root 10 years ago, but times have "changed". He said: "The music world has changed. Ten years ago, we'd have been against co-writing with other musicians. It was : 'We're a ban, it's about what the five of us can create behind closed doors.' But that's a daft way to approach it. Why, for the sake of ego, would you not make a song as good as it can possibly be?" Wayne Hector - famed for his work with Nicki Minaj and Westlife - has co-written the song 'Sunday Morning' while British singer/songwriter MNEK co-wrote 'Press Rewind'. MNEK came to help with the song after the album's producer Brian Higgins - most-known for his work with Girls Aloud - suggested him. 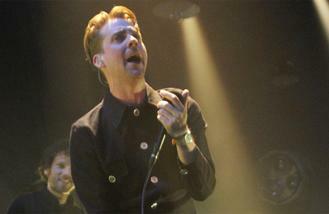 Ricky, 38, told NME magazine: "Those were songs that I'd taken so far and couldn't push further. On 'Press Rewind', I was spent. A few days later, Brian Higgins said: 'I've got someone else to have a go.' When he played us what MNEK had done, it was f***ing brilliant. People are impressed that we've got Wayne and MNEK writing with us than if we'd done it on our own. They're going 'Wow, how did you get Wayne Hector? and I'm like: 'I didn't even know he was doing it.'" 'Stay Together' is released on October 7. Example has been sitting on his new album for over a year. Billy Ray Cyrus is thrilled his daughter Miley has found love again with her ex-fiance, because she has never been happier. Demi Lovato is enjoying her new-found freedom after moving on from a six-year romance. Kim Kardashian and Kanye West's daughter North asked for an aeroplane so she could visit her grandmother in heaven. Dolly Parton has pushed back plans for a gay dance album since bigger projects keep popping up. Nick Cannon claims ending his marriage to Mariah Carey is "beyond his control". Backstreet Boys' A. J. McLean has asked Meghan Trainor if she will do a duet with them. Solange Knowles has taken to the streets of Louisiana as part of a police brutality protest.